I’m Irish but long term settled in Singapore – arrived for 3 weeks in 1993 and still here! My wife is Singaporean and we have 2 great teenage boys rapidly approaching NS age. I’m Irish but long term settled in Singapore – arrived for 3 weeks in 1993 and still here! My wife is Singaporean and we have 2 great teenage boys rapidly approaching NS age. I have been dabbling in endurance sports since running SCM in 2006 and flailed my way through a few full mara’s and 70.3 tris. An Ironman has always been out there, quietly beckoning, and as I approached the magic 50th birthday – I decided I needed to do something about it. 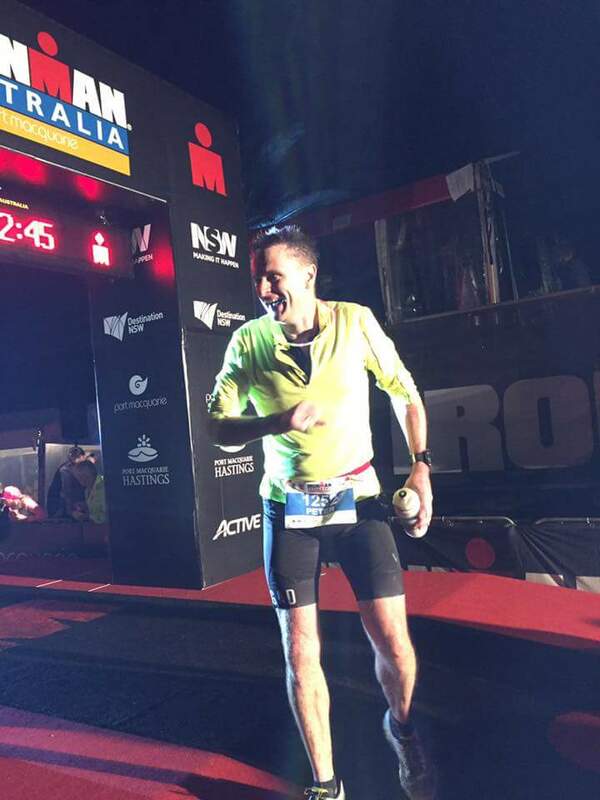 How did you feel crossing the line of your 1st Ironman? Absolutely sensational! Overwhelmed by the whole thing, amazed I made it. Thrilled to see my family there at the finish. The race organization machine was spectacular – a bit intimidating but they had covered everything – not an amateur in sight! The check in, the briefings etc were super professional and everyone was so helpful. The nerves were building and I was trying my best to focus on a friend’s advice to “trust the training”. The swim started off reasonably orderly – 4 or 5 swimmers every 30 secs, spectacular morning, calm water and actually enjoyable. There was a weir to cross on the outbound and return which was an interesting experience. I had coach Shem’s advice echoing in my head – pick some reasonably fast feet and chase them! Exiting the swim and glancing at my watch I was thrilled to see 1:05 split – best swim to date and barely winded! The bike opens with some killer hills leaving the town and again Shem’s advice echoing – easy, conservative spin, dont smash it. Got thru the hills and settled into the long pedal. Nutrition was exactly as my last long training ride and munching on dates in hour 2 was vaguely reassuring. The road surface was a shock – unsealed and a bone rattler. The weather closed in after a couple of hours and wind and rain slowed the proceedings. The second 90km loop was a bit slow and super glad to hand off the bike after 6 and a half hours. Transition support was amazing – like having a personal butler! I headed out on the run again with Shem’s advice ringing in my head – “this is just a typical Sat morning run, thats all”! It worked I guess, pace was off a bit but comfortable. Ground through 3 laps, treasuring each of those rubber bands and not daring to look at my watch a single time. Walked a few water stops but otherwise was amazed I was able to keep it moving. The temp dropped as sun set and I was glad of a long sleeve shirt in special needs. I checked my watch for overall progress on collecting teh 4th band and was really pleased to see 13hours was doable. The last lap was a blur – the only thing I remember is a kid pushing a vegemite sandwich into my hand at one stage – WOW! I thought I hated Vegemite but that combination of salty taste and chewable food just blew me away! New training food! The finish was amazing – running down that chute, I struggle to describe the feeling! “Trust the training” – I just kept that in my head. the individual legs were all OK – the combo was new territory. I just had to relax and figure all that training was in there somewhere. It quickly became a routine – pool Mon, Bike to work with 45-60 mins on Mt Faber Tues, Track Wed, Bike to work with Faber on the way and the way back, pool friday, long ride Sat and long run Sunday. Work travel in the last 5 weeks went a bit nuts and it took some real prep to keep training and nutrition on track. I think I trained in 7 countries in 5 weeks! It was all about flexibility and a good deal of luck. I was amazed at the building fitness without injury – I have always approached marathons nursing something, this time I felt fantastic. I ended up printing and binding all the plans and making notes as I went. Adding the calandar for teh last 8 weeks and the race guide – created a great souvenir I will treasure. Its not about the 13 hour race, that was actually easy – its about the meticulous mental and physical planning for 9 months before hand. Not everyone wants to hear about your training all the time – when you train 15 hours a week it begins to dominate everything. The weekly summary and Shem’s commentary worked for me. Checking in at Track or Pool was good. I can probably do anything with the right coaching, equipment and lead time! I may have gotten thru this without a coach but I would never have had the positive experience. 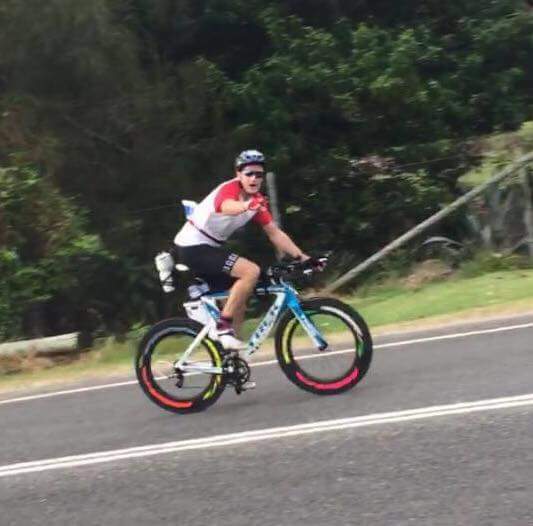 Managing the steady fitness build, advice on equipment and diet, avoiding over training, race day strategy etc – I was actually able to enjoy it. The group sessions at the pool and track were great to mix things up. Don’t know, but a niggling though that I could have taken 20 mins off the bike and 30 mins off the run…..